Working on quilts has proven to be difficult. The slightest rustle of fabric and Oliver is all over it, whether its at the sewing machine, being layered out on the table, laid out for photographs, or freshly out of the wash. He has truly found his happy place. Except not too happy for me when I'm trying to get things done. Here he is caught red-handed time and time again! Only on quilts though, he never shows any interest in any of the my other sewing projects. Skirts, dresses and bags are entirely safe. There seemed to be only one solution – make Oliver a quilt of his own, so when I'm sewing I can lay that out and keep him off my work. Of course it makes him very happy too, so he should have a quilt of his very own. With his one leg missing, he sometimes seems to find it hard to lie out comfortably and often drags fabric into a pile to lie on, so I know he'll love the softness of his quilt. When I made my serger jelly roll quilt I had triangles left over on the sides after cutting the large square blocks from the center of the big fabric piece. These sort-of matched because they are the same fabric, but these are triangles sewn into blocks, to use up all the bits, rather than just the square blocks. I did toy with the idea of adding them to the back panel of the quilt, but well, I was sending it out for quilting to Lucy for long arm quilting and didn't want to give her any extra work to do, so instead I made up the 3 spare blocks into a single row. Lucy quilted these for me separately, I added a matching binding and there you have it! Oliver has the perfect cat sized quilt of his own. Now he can pull in those ends and make himself a little pillow, or usually, he scrunches it up and rests his shoulder on the thicker part of the quilt to make up for his missing arm. He now sleeps like a baby and loves his quilt. In fact, we have to move it around now to his various sleeping places. So on the bottom of the bed in the mornings, on the sofa for the afternoon, and then up on the top of the back of the sofa where he lies stretched out for the evenings to cool down, while we watch a film. I can also move it into the sewing room to keep him off my work in there too. Perfect. Oliver loves his new quilt. 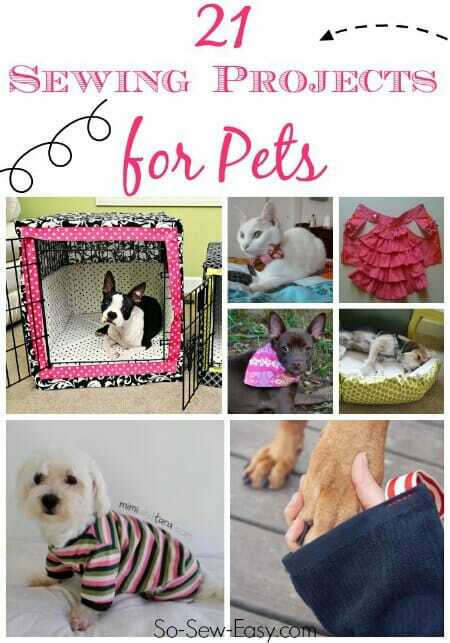 Want to sew some items for your pets? Here's a round up I did earlier this year of ideal sewing projects for your pets, for National Dress Up your Pet Day. Yes, there's a National Day for everything! My cat will sleep on any fabric ‘just lying around’ so I have to be careful, but the worst is my ferret, he can’t stand not being apart of any quilting action. I have an Oliver also! He loves to lay on any fabric I have on my table, but it’s my cat, Dinah who loves my quilts…she can’t resist laying on any quilt I’m working on. I keep my fabrics in clear bins, any open bin will have her curled up looking happy every time! I keep kitty beds on the end of my sewing table in front of the window because my cats love to be in the room with me & they also want to keep an eye on what’s going on outside (indoor only kitties). 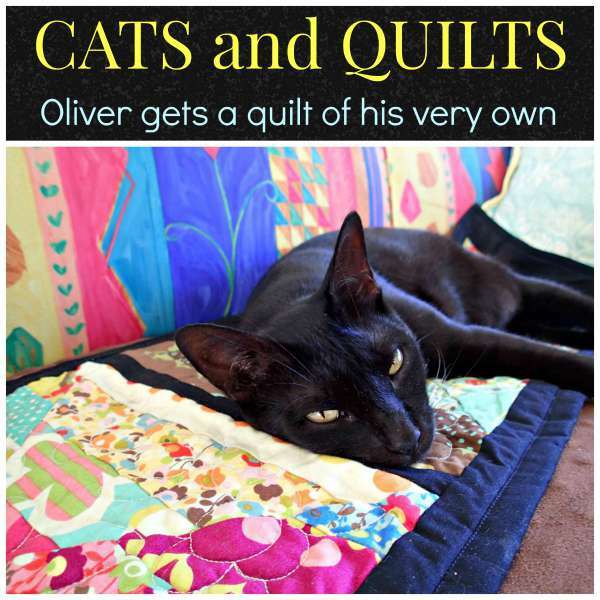 Loved seeing your Oliver enjoying his own quilt! Great idea. Adorable cat and quilt! My cat loves to help with sewing projects too. What a sweet story. Lucky cat, lucky Deby. What a beautiful cat! Reminds me of my Noche and Winston. 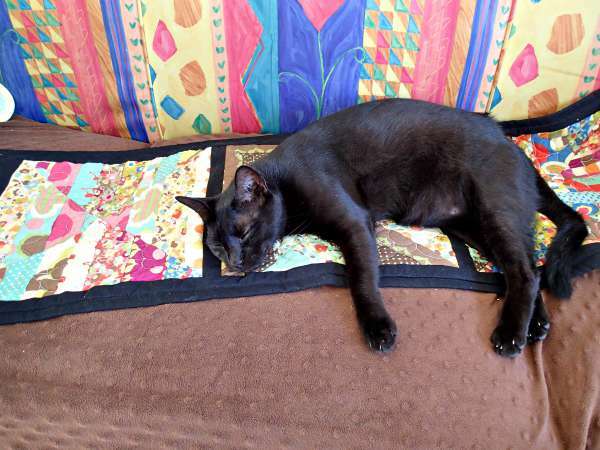 He’s definitely found his happy place on the lovely quilt you made! 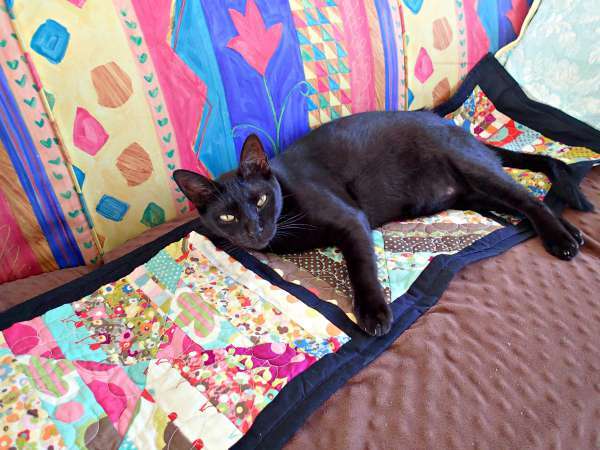 Love the quilt and the cat and not to be a party pooper – that’s why I don’t have an inside cat! But I do have trouble with my dog! That is good. Oliver is good kitty. Mine get on everything. If you put a little bit of a potato chip (crisps?) bag inside part of his quilt, he might like the noise it makes, too. I have two kitties that really need quilts of their own too. Although as nosey as they are, they would probably still like to be up in my face as I sew. I am glad Oliver is content to lay on his new quilt! My cats want to lie on top of ANY fabrics I am working on (not just quilts)! Rotary cutting can be interesting–sometimes I just have to wait til they are napping, then I can sneak into my sewing area. 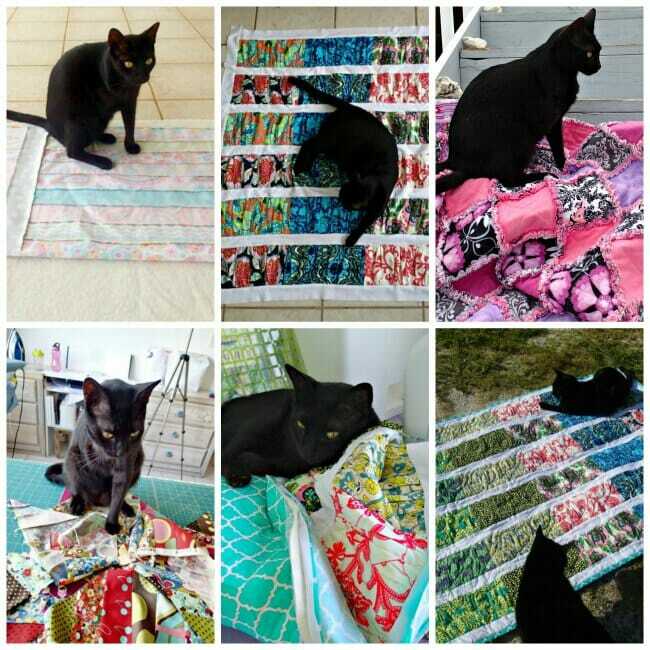 It really made my day to see that you made Oliver a quilt of his own–you are both lucky to have each other! Oliver sure looks like a content kitty lying on that quilt!! He sure is pretty! This post is so beautiful that it makes me cry. So glad that precious cat has you!! Lucky Oliver! Sweet cozy quilt, making a cat very happy. I had a mini schnauzer whose name was Oliver, and he loved his woobies and blankets. Gotta keep them happy!! Oliver is just beautiful and so graceful. 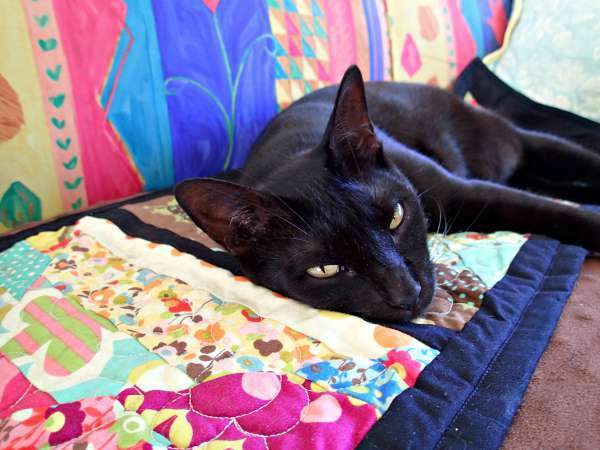 I am happy you made him a personal quilt, he looks so regal on it. Aw. That’s wonderful. Oliver sure does look like he loves his quilt. The second to last picture of him just oozes contentment. Aww, that’s so sweet. He looks really happy with his quilt, too, lucky cat! Debi, hope you guys will be OK with Erika heading your way. You’re in the line of fire, aren’t you? We’ll be fine. The storm will be many miles away from us, but thanks for checking in! Got to keep that sewing machine dry.